The Fitter & Faster Swim Tour Presented by SwimOutlet. com. is the proud sponsor of the Age Group Coach of the Year award. 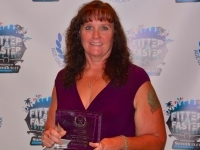 On Friday September 12, 2014, Dynamo Swim Club Associate Head Coach Beth Winkowski, 44, was presented with the inaugural Fitter & Faster Swim Tour/American Swimming Coaches Association Age Group Coach of the Year Award by Fitter & Faster founder David Arluck. Chosen from a field of 10 finalists, Winkowski epitomizes what it means to be an age-group coach, cultivating swimming talent at every level, keeping swimmers in the sport, mentoring new coaches and laying the foundation for her athletes to succeed at the collegiate, national and international level. 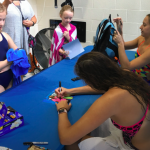 Nearly two decades into her second career, she is much happier racing the clock, spending her days grooming young swimmers and coaches at the Chamblee location of Georgia’s prestigious Dynamo Swim Club and being a mom to Ceara, 11. Winkowski, who has been at Dynamo since 2004, is responsible for a senior squad of sectional and junior national qualifiers as well as preparing 13 and 14-year olds to join the team’s senior ranks. Winkowski, who says one of her proudest moments as a coach was helping a swimmer become the first in her family to attend college, prepares all of her athletes for university life regardless of their recruiting status. 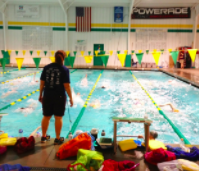 What’s the appeal of working with age-group swimmers? “By the time swimmers get to college, they’re pretty much fully formed. I like to get my fingers in the clay and help form who they’re going to be,” Winkowski says. She leaves no stone unturned when it comes to improving her swimmers’ habits in and out of the pool, Dynamo assistant coach Cecelia Tripp noted during the nomination process. 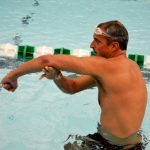 This includes bringing in a master coach to help swimmers and coaches with underwater development and organizing a clinic led by Olympian Ryan Lochte. “Dynamo loves to plan travel trips every summer and Beth takes a very active role,” Tripp adds, citing this summer’s 4-day camp at the U.S. Naval Academy that included training sessions, technique sessions, motivational speakers and team-bonding activities. “The swimmers have not stopped discussing all that they learned or the great memories made during that trip,” she says. Her motivational skills do not stop at the water’s edge or the age of 18. She is known to break a sweat alongside her athletes, competing in open-water races and community runs. She’s also active in mentoring the team’s junior coaches, some of whom swam under her as age-groupers. Early in her career, Winkowski taught herself by “sitting near a different coach at every meet, listening to how they talked to their athletes.” She also made a rule of picking out three takeaway lessons from coaching conferences so that she wouldn’t feel paralyzed by all the technical information being thrown around. Do you have what it takes to contend for Age Group Coach of the Year?